Kitchen Chat, Week Eight: Cookbooks! 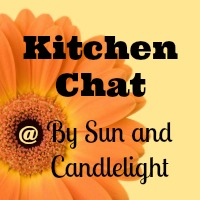 Welcome to another week of Kitchen Chat! Please help yourself to the bread basket - a warm rhubarb scone, perhaps? - and pour yourself a hot cuppa something - tea or coffee, there's plenty of both. Let's settle in and talk about COOKBOOKS! From conversations I've had, and comments I've read - here and elsewhere - I think it's safe to say a great many of us have a bit of a cookbook obsession! So to start, I have just a couple of "cookbook questions" for you all today ... so if you have the time and inclination, please leave your answers in the comments box below. Where do you store/display your cookbooks? What is (are) your favorite cookbook(s) - and why? 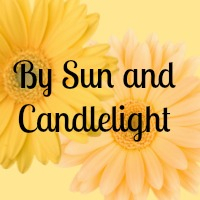 I also have several wonderful cookbook pictures to share and I must thank the lovely ladies - Michelle, Jo, Shirley, Carol and Mary - who sent me photos for this post! I think it adds such a fun element to these chats when we open our kitchens up to each other! At the old house I kept my cookbooks on the counter to the right of the stove, but since I now have more cabinets to "play" with, I felt I could devote a shelf (maybe a shelf and half) to these books. I like how they look here - I can obviously see them through the glass, and it makes me smile to see them on display. I've been collecting cookbooks since I was a teen ... I loved looking through my mother's and grandmother's cookbooks - especially the really old ones, with the super-thin pages and personal notes in the margins. I would say my favorites to read through nowadays are The Silver Palate Good Times Cookbook (currently, MIA) and Jamie at Home, shown above. I tend to enjoy books that reflect New England and British cuisine/lifestyle as well as those that feature baked goods and organic/seasonal recipes. I can read a cookbook like Pippa Middleton's Celebrate, front to back, just for the comfort and joy it inspires! But that's enough from me ... now let's hear from some dear friends - regular readers, all - who are also sharing their own cookbooks today! "Here are some of my favorites in their home in our kitchen. Some of them are books that I just enjoy looking through. Others, like the Indian Vegetarian cookbook, are cherished ones that I use for inspiration regularly." "I have attached a few pics of my cookbooks. My favourite ones are falling apart! One of them is stored in a Ziplock bag to keep it all together. Of course the pages have splashes and stains - all evidence of being well used and well loved. I am lucky to have a very convenient little shelf in my main storage cupboard that holds all my cookbooks beautifully. I have not really added to the collection for years as the Internet is a wonderful free source of endless recipes." grandmother gave to me. I display my cookbooks in my kitchen on shelves that are below my kitchen cabinets, but I also have several binders that contain printed recipes stored inside my kitchen cabinets. And last but not least, sitting on my kitchen countertop is my tried and true recipe box holder. It contains handwritten recipes that I have used for years and years." "Here at Chestnut Hill I have cookbooks in many places. I have this Shaker Shelf in the kitchen between the large wood cook Stove and the Electric stove. I keep every day cookbooks, and anything that will fit on the shelves. Then in the living room I have some stacks of overflow or of cookbooks that I do not want regularly exposed to grease and wood stove dander. I would love to have a Library or at least nice built in shelves, but our home is almost 200 years old and neither are possible. Favorite Cookbooks . . tough . . .
"I've included assorted pictures of my cookbooks. I have over 1,000! My mother was a collector and passed that gene on to me. :-) Together, we have amassed quite the collection over the years. In my home, our dining room also functions as our library. In addition to the "library", I also stash my cookbooks into every available nook and cranny I can find! I once read that Nigella Lawson brought in a librarian to catalog all her cookbooks ... what a dream that would be! :-)"
"My husband put together a couple of bookcases for me over the weekend to put in my breakfast area to hold my cookbooks. I recently weeded out my cookbooks because our eating style has changed. I am starting a new collection to match the way we eat now. Each month I get a few more with my book money." Well, my friends, I hope you've enjoyed our cookbook photos and comments. I would love to hear about yours ... so if you can, please take a few moments and leave a comment answering this week's questions (shown near the top of the post). And if you want to send me a photo, please don't hesitate - I can always update this post with more submissions. I'm thinking for next week ... how about "kids in the kitchen?" I'll post more on that idea, but in the meantime, if you have a suggestion, please let me know! Have a wonderful Monday, everyone ... I'll see you back here again very soon!